Your house is more than just a shelter-it's a place to unwind and create memories with your friends and family. For something so important, shouldn't you know more about it? Peak Property Inspections can help you learn about the condition of your home. Come to us for your next home inspection in the Arlington, TX area. You can count on our home inspector to walk you through the findings and let you know whether your house is safe. Call 817-422-4708 now to get started on your home inspection. A reliable home inspector in Arlington, Dalworthington Gardens, and Pantego, TX will be happy to answer your questions. To make sure your home in Arlington, TX is safe to live in, get a full home inspection today. A proper pool inspection can save you from costly repairs down the line. Count on a reliable home inspector to check your irrigation system for damage or uneven water coverage. Check the condition of your insulation and electrical wiring with an infrared inspection. Why choose Peak Property Inspections? Peak Property Inspections is certified to act as an inspector of residential property under the Voluntary Inspection Program (VIP). 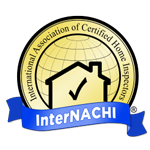 This certification allows for the conduct of residential property condition evaluation inspections. Certificate of Appliance-Related Water Damage Remediation. Copyright © 2019 Peak Property Inspections, all rights reserved.